We are just under a month away from Valentine's Day and the kids and I have been hard at work creating some fun and unique Valentine's Day cards for their friends! Today I'm going to share our top 3 favorites with you all and show you just how easy these are to create with your little ones! Use the glitter washi tape to secure your toy figure onto the cardstock. We had some fun and did each card a little different to feel a bit more personalized. Once you figure out where you are going to place your toy figure go to town with your stamps! The stamps are totally optional, as you can easily print your message using a computer and printer, but I found that my 3 year old had a blast helping me stamp them down and I found that I loved the character the uneven letters provided. These are all great non-candy and fairly inexpensive options to pass out to friends for Valentines Day. If you looking for something more appropriate for children age 3 and under, you can check out my latest post at www.NicoleBanuelos.com for a fun bath inspired DIY Valentine's Day Cards for ages 6 months and up! Want to win a $15 shop credit?! Comment below with your thoughts or share a cute Valentine's idea of your own for a chance to win a $15 shop credit to Noxx! Winner will be randomly selected from the comments and notified by email on 1/26/17. Love these! Cute and creative without costing a fortune! So glad to see something other than candy or sweets for littles. The bath ideas are my favorite because that is my son’s favorite thing to do right now ?. Definitely going to save these ideas for future use too! Thanks! I love these!! We’re for sure going to make the army men ones for the neighbors! How cute and not CANDY! These are so cute! 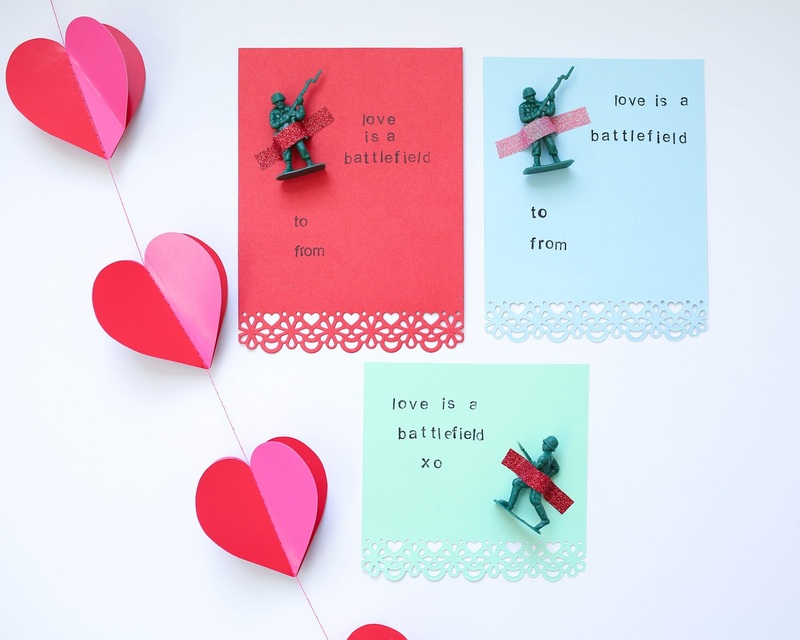 Love the battlefield with little army men one. I have to remember these for when my little actually goes to school. For my oldest valentines for school the last two years we did cute little diy valentines. My daughter and I will definitely be making these for her V-Day class party! Super cute!!! LOVE ❤️ these ideas!! So simple to make, especially for the non crafty mom like myself ? Definitely saving the idea to use when my little man is in school. Thanks!! Love these ideas!! Homemade valentines are always the best! My son collects rocks so this year I think we are going to do “you rock” valentines with specially picked rocks from his collection? Cute ideas. My 4 year old would love to make these for his class and I always like candy alternatives. These are all awesome ideas! I love that they include a toy rather than chocolate. The little soldier card is definitely the best one <3. I’ve been racking my brain (and Pinterest ?) for sweet Valentines, and I think these might be the winner! Love them! Love that it is not just candy and something they can keep and play with!! The cards are adorable. A few years ago for V-Day I had his favorite food – pizza – made into the shape of a heart. Adorable and edible! This is the cutest idea!!! I love them! Your bath toy Valentines are literally the cutest for little ones!